When did visionary leadership fall out of fashion? The article, Move Over, CEO: The Time Is Right for the Chief Financial Officer to Be a Co-Leader, addresses the crisis of executive leadership in corporations. At the start of this decade, billions of dollars were lost in a series of corporate scandals marked by fiscal mismanagement, fraud and outright greed on the parts of CEOs, CFOs and other senior executives. The public and legal backlash gave rise to new thinking about the ways companies should be organized, managed and governed, placing greater emphasis on accountability, regulation and transparency. New regulations were passed, including the Sarbanes-Oxley Act, which thrust the CFO into the forefront of the boardroom and helped create a new balance of power between CEO and CFO. Is visionary leadership the problem? Is “accountability, regulation and transparency” the solution? Is the changing role of the CFO really the answer to the problem of senior executive misconduct? Even if you change the organization’s structure, by redefining C-level roles, instituting new rules and regulations, calling for more openness, if you don’t have men and women in positions of authority who have a genuine moral core to their lives, you’ll end up with the same ethical problems. We need to establish ethical standards for the behavior of leaders at the top of the organizational chart, and by extension the company as a whole. In order to do so, we must determine what we mean by ethics It is an important question that is far greater that executive misdeeds. 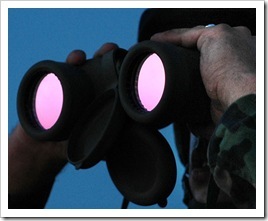 Generally speaking, ethics as applied in organizational settings is about staying out of trouble. It is focused on what is right and wrong, not just legally, but morally as well. I find this a narrow and ultimately self-defeating approach to ethical behavior. It plays well to the game of work-around solutions and ethics based on good intentions rather than the results of behavior. To understand this in leadership terms is to see the distinction tactical adjustment and strategic change. The late Peter Drucker distinguished between efficiency and effectiveness as the former doing things right and the latter doing right things. The difference here is between ethics that is simply a set of rules to direct behavior and ethics as an holistic perspective that integrates and aims all aspects of a business toward a common vision. Twenty three hundred years ago, the philosopher Aristotle addressed the same issues. For him, the good in life is not what is not bad. The good is the focal point of our purpose, our aim, our goals. In business terms, we talk about the mission of the company. In personal terms, we speak of our lives having a calling to make a difference in a particular way. That impact is the creation of some good, not simply some result. It is the quality of that effect that matters. It is this quality that is missing in many organizations. … the two positions, while maintaining distinct duties, have come to be seen as necessary counterforces in a company’s power structure: one, the eternal optimist pushing ahead at full speed; the other, the realist, urging caution and remaining wary of risk. The two must function as a team, addressing needs for both growth and responsibility. Without a clear sense of mission, or of the good to which all members of their organizational community aim, the relationship between CEO and CFO can easily devolve into conflict over power and authority. This is why it is important for a person in authority to develop the ideological assets of what I call the “connecting ideas” of Mission, Values and Vision. An organization’s Mission focuses on the “good” of their impact. This organizational aim must be aligned with the structure of the organization. If the expression of the mission is unclear or too general, then the company ceases to focused outwardly turning inward toward survival and self-preservation. This is one of the ways corruption creeps into an organization. The Values of the organization provide the glue that unites people together to focus on the good they wish to achieve. When a clear understanding of the unifying values is absent, it is easy for each person to adopt their own preferences as operation values. The old line of “what’s in it for me” becomes the default values of the company. It is then that various kinds of corruption can begin to grow. Values are not preeminently marketing concepts. Rather, they are the standards of behavior that are expected of the company and its people. Just like the organization’s mission needs to be aligned with the structure, its values need to be “operationalized” in the policies and practices of the organization. Values that lack a practical application in the functioning of the organization will lose their importance and impact. As the third connecting value, a vision is a picture of what people united by their values do to fulfill their mission through the organization’s structure. This vision needs to capture what it looks like for people to be functioning at their highest level of effectiveness through the organization’s structure. As much as possible, this vision needs to be visual so that it becomes a reference point for later. This kind of vision is not “the eternal optimist pushing ahead at full speed” in some kind of dream-like fantasy. In effect, a vision of this type integrates both optimism and realism into an achievable picture of the future. The need for optimism and realism has never been more needed. Those qualities of leadership are not role defined, but are determined by the moral character of the leader. We need to think differently about the problems of corruption in organizations today. We need to see it as indicative, not of a failure of oversight, but rather a failure of personal integrity. Only be developing a clear and operational set of values can the moral behavior of leaders bring new strength for growth and sustainability in the future. 1. What is the legacy of my life and my business? When both are gone what will be the impact of each? What difference will we have made. If you have something to share, please do so in the comments. Thank you. Tagged with accountability, aim, Aristotle, CEOs, CFO, Charles Taylor, ethics, good, legacy, mission, moral, optimism, organization, Peter Drucker, philosphy, realism, regulation, right, rules, standards, structure, transperancy, values, vision, Wall Street Journal, wrong. Two leaders sharing the top position? That's confusing and can lead to significant conflict. Why not add a third – the Chief Ethics and Impact Officer? Nope, this doesn't make sense either. Maybe the entire board can be more involved in running the company? They are supposed to have the final say – not the CEO (at least in my understanding). 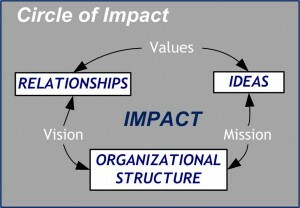 Once again you have pointed out how the Circle of Impact can be of use in understanding the important components of lasting impact. I'm actually surprised by the article by the professors of management. Leadership by two individuals leads to even more challenges. We can certainly hope for a Servant Leader, as Robert Greenleaf or Mark 9:35 would suggest.